According to The Hollywood Reporter, Tom Hardy and New Line are developing an adaptation of Brian Azzarello and Eduardo Risso’s 100 Bullets comic series. The script will be written by The Vatican Tapes’ Chris Borrelli, and Hardy is considering starring in the project as well. 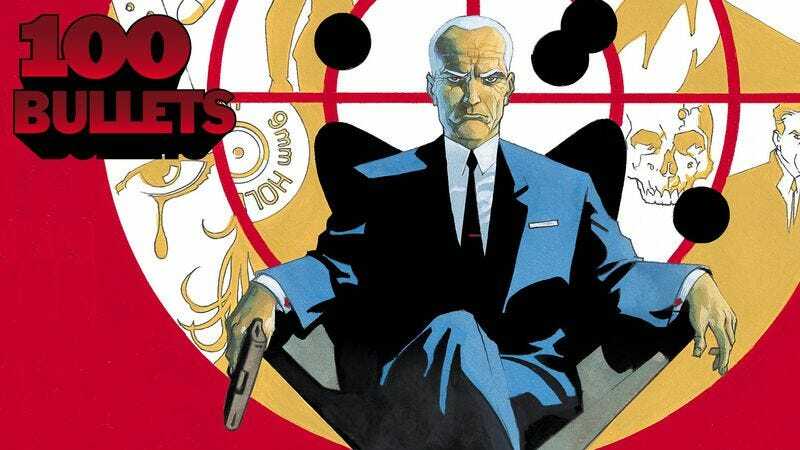 The comic version of 100 Bullets is sort of a sprawling crime epic about secret organizations at war with each other, but the basic premise is that a mysterious guy named Agent Graves travels around and finds people who have been wronged in some way. He gives these people a handgun, 100 bullets (get it? ), and information on the identity of the person who wronged them, and then leaves them to do whatever they want with these items. 100 Bullets ran for 100 issues on this setup—plus a sequel/spinoff—so the story might have to get significantly compressed to fit into a movie. But we assume Hardy and New Line wouldn’t be going for this if they didn’t have some kind of plan in mind. This is New Line’s first comic book project since Warner Bros. handed over control of DC Comics’ Vertigo-branded titles, which covers most of the publisher’s more “adult” books like Preacher and Sandman.